blog.HalloweenAdventure.com | Latest News from the Costumes Trend FrontLines! : Even More Toddler Costumes! 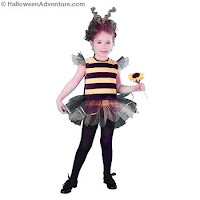 Buzz buzz buzz, little girls all over will love our Bee Mine Toddler Classic Costume. This one will have everyone else totally jealous, with its adorable pouf skirt and headband. Includes: Yellow and Black costume with attached netting skirt and antenna headpiece. Loyal Blue’s Clues fans will love our Blue’s Clues Plush Deluxe Costume. 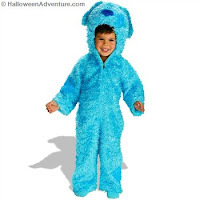 This plush deluxe costume includes: Blue plush bodysuit with front zipper and character hood. This is an officially licensed Blue's Clues™ costume. 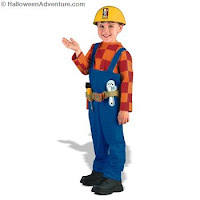 Do some tough construction work in our Bob the Builder Costume. ob Deluxe Costume includes printed checker shirt, blue overalls, yellow construction hat, belt with sound box (with a real hammer sound), wrench, screwdriver and hammer. This is an officially licensed Bob the Builder™ costume. Dart around the garden in our Butterfly Fairy Toddler Costume. This adorable dress is covered in pastel flowers and cute little silver wings. 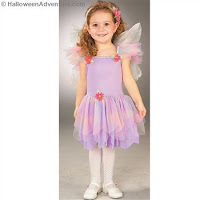 Butterfly Fairy costume includes headband with flowers and light purple dress made of 100% polyester with silver wings. Our Candy Clown Toddler Costume is good enough to eat! 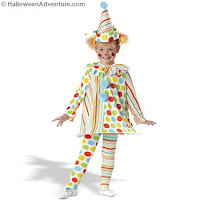 Covered in candy dots and multi-colored stripes, this costume is so cute you won’t be able to resist it. Includes polyester dress with attached hoop, ruffled collar, hat and leggings. Superhero children unite! Our Captain American Toddler costume takes Marvel’s best and transforms it into an outfit for your littlest one. An officially licensed Captain America™ costume based on the Marvel® comic book character. Outfit includes a Red, White and Blue bodysuit and character cap. For more toddler costumes, check out Halloween Adventure’s online store. We have an entire section dedicated to costumes for little ones! Scoop yours up now before it’s too late!